LEGO City Advent Calendar for 2010 is a great way to count down the days until Christmas. One of the Best Toys for Christmas 2010 is the Lego City Advent Calendar. 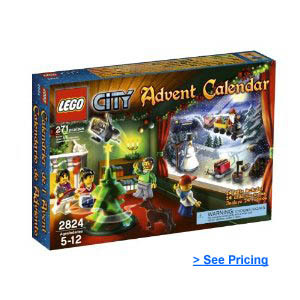 Have fun counting down the days with this 24 Day Advent calendar set from LEGO City that you and your kids will love! This is an annual tradition for many families or perhaps this is the year you start this new tradition with your family. Open a window for each day leading up to Christmas 2010 and your kids will love celebrating the holidays all month long with the excitement of opening each window and finding little suprises with in. There are 271 Lego pieces that come with this set. It is recommended for Ages 5 years old and up.